Continuing the high standards set in Birthright #1, "Heart of Darkness" covered some larger themes that I found fascinating. 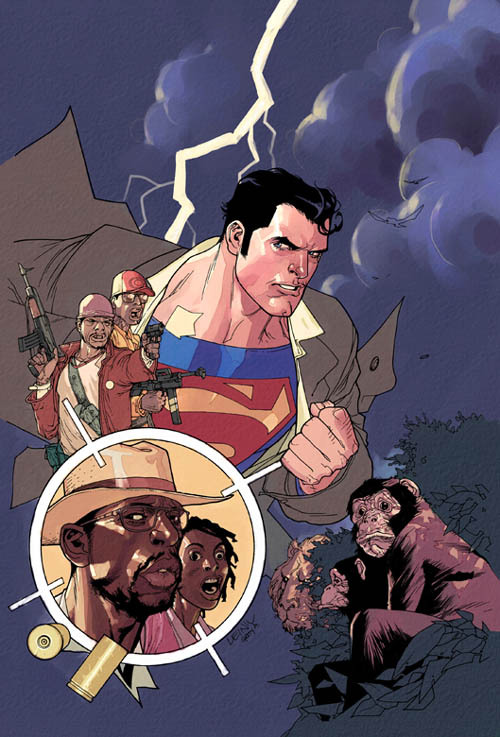 Chief among these themes was Clark's emerging sense of who he is and the role he is being "called" to. 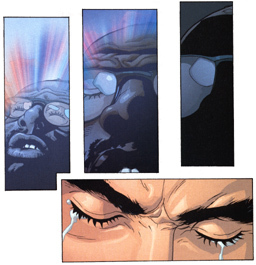 Though there are strong ties to the '78 Superman movie already evident in Birthright, an important difference that has started emerging is the emphasis upon Clark's unique, internal deliberation leading to the decision to become someone other than just Clark....or, as Clark himself explained to Jonathan Kent, "I'm also someone else, Pa. It's time I started finding out who he really is...". In this new take on the origin, his Superman identity is not suggested by a crystal-projection of Jor-El nor by the Kents. It's Clark's own decision, arrived at through his own trials and challenges....and it's this new "ownership" of his emerging life as Superman that I find so fresh and invigorating to the legend. I was also fascinated to see the elevation of the classic "S" symbol into something entirely new. 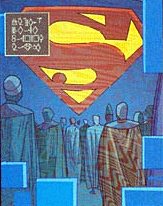 While the Superman movie first introduced the ingenious incorporation of the "S" as the El family crest, Waid takes it a step further and elevates it to a Kryptonian glyph, or visual symbol, of great power and meaning. In my own musings, I likened the "S" symbol to the level of, say, our own American flag, especially with this key line: "the Symbol" was "...a promise. A sign of people fighting to make a better world. A symbol of hope." Now, I'm not trying to get into Waid's head....for all I know he was thinking of the U.N. flag or some other personally meaningful visual symbol. But, when I think about the words spoken by generations of immigrants to America, I hear their feelings toward America and the promise represented in its flag echoed in that phrase. So, in a way, Kal-El will "wrap himself in the flag" as he steps into his Superman role. Again, not to belabor the point, but the thought really touched me and got me thinking....something a Superman comic book hasn't done since....Lord, who knows when? Another theme: the death of idealism. Or, more accurately, the maturing of idealism. Clark's earnest effort to help the troubled African society, through his efforts to talk and reason with the oppressors while at the same time staying the hand of the mob, shows a young man who believes everything will proceed "on script"....that the good guy gets to say his piece and the nasty guys will be overcome by the simple logic of it all, and everyone will hold hands and sing. That's not how things go most of the time, as Clark painfully learned. Fear, hatred, ignorance and apathy have a way of conspiring against idealism, and Clark sees, up close, the cost of raw idealism in the face of brutal reality. The scene of Kobe's life-force leaving him, from Clark's perceptions, was powerful and heartbreaking. At this point, life ceases to operate at the academic, theoretic level for Clark and becomes REAL. 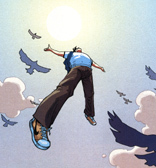 The end of his anonymous "Traveling Angel" routine becomes obvious to him and to us. You feel, along with Clark, that a new way must be found. THAT'S good writing: when you come to the realization along WITH the character instead of just sitting there on the sidelines wondering what's going through the character's head. Fantastic job, Mr. Waid. I really loved the Kents. Just as warm and interesting as they are on "Smallville" (not to mention visually similar). Say good-bye to the Ma and Pa Kettle caricatures with that silly, corn-pone "Jumpin Jehosephat" nonsense other writers have too often saddled the characters with. And, yes....Lex and Clark lived in Smallville together. About time and very welcome. I can't wait to learn more. Oh, and that artwork by Mr. Yu. What a a gift to have a guy this talented working on a Superman project. Just...amazing stuff. Almost bordering on the distracting it's so good! I adore the design of each page, the resonance of the facial emotion and just the unique look of Yu's style. It's like nothing else on the stands today. Whoever hired this guy, give him or her a raise. And a car. Though only two issues into it, Birthright has become the change-agent I've been hoping for to pour new vitality into DC's sagging Superman franchise. I have to wait a month for the next one.